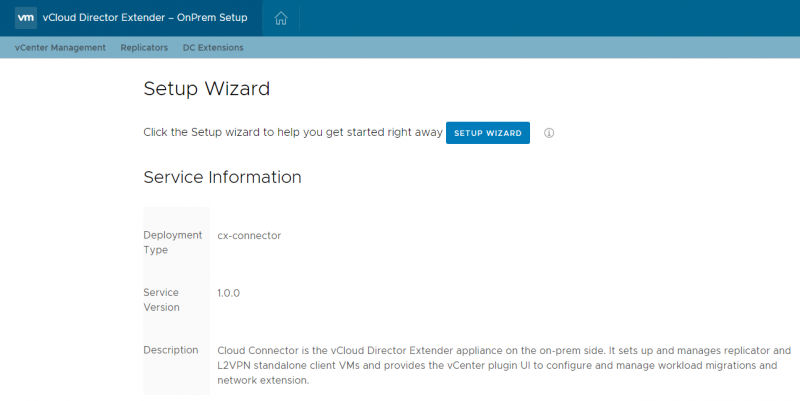 In this 5th part of my look into vCloud Director Extender (CX), I deal with the extension of a customer vCenter network into a cloud provider network using the L2VPN network extension functionality. 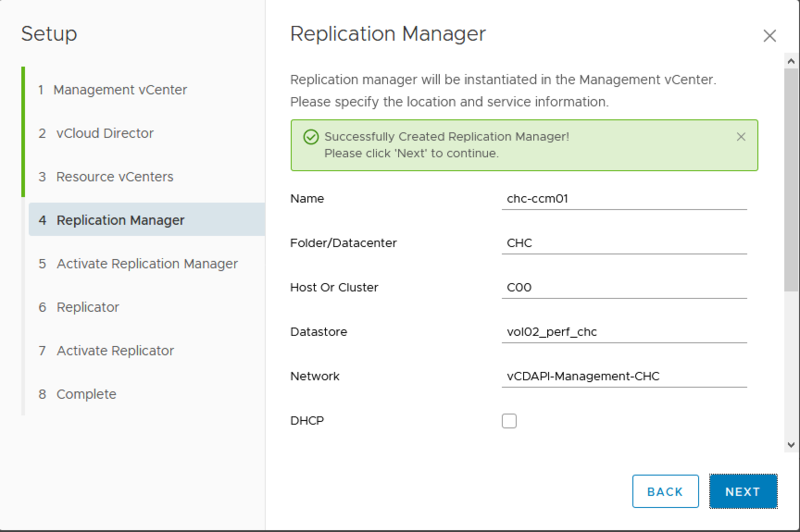 Apologies that this post has been a bit delayed, turned out that I needed a VMware support request and a code update to vCloud Director 9.0.0.1 before I could get this functionality working. 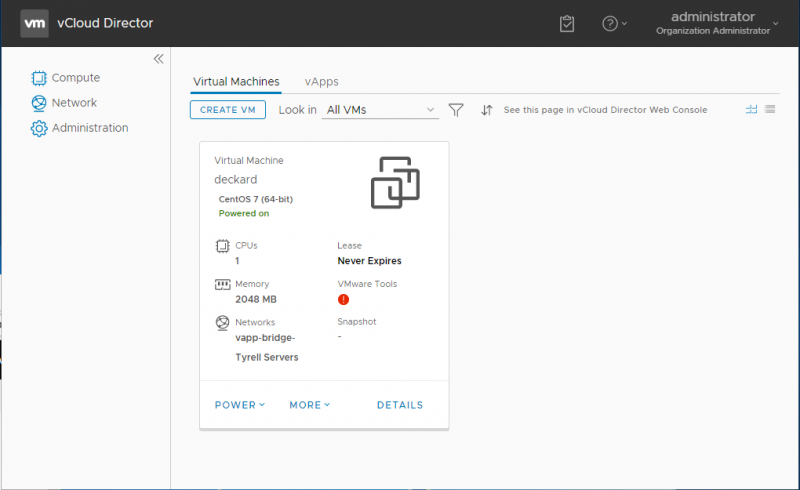 (I also had an issue with my lab environment which runs as a nested platform inside a vCloud Director environment and it turned out that the networking environment I had wasn’t quite flexible enough to get this working). Update: an earlier version of this article didn’t include the steps to configure the L2 appliance settings in the vCloud Director Extender web interface – I’ve now added these to provide a more complete guide. I won’t deal with the use-case here that the customer already has NSX networking installed and configured, since in most cases you can simply create L2VPN networks directly between the customer and provider NSX Edge appliances and don’t really need to use the CX L2VPN functionality. 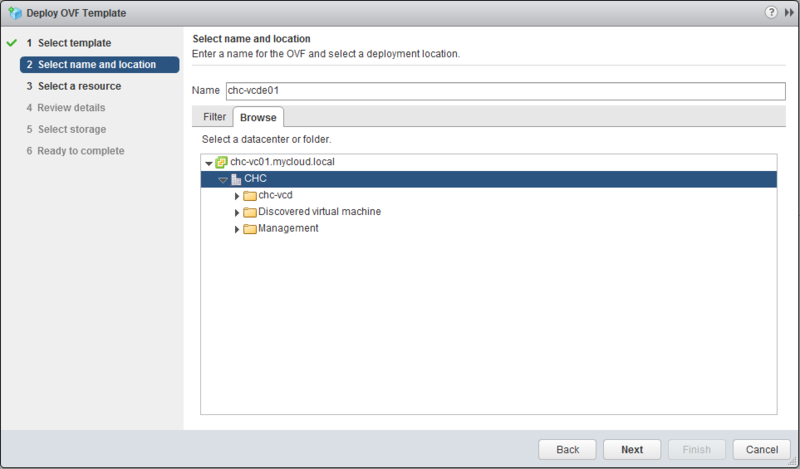 A tenant vSphere environment with the vCloud Director Extender appliance deployed (it does not appear to be necessary to deploy the replication appliance if you only wish to use the L2VPN functionality, but obviously if you are intending to migrate VMs too you will need this deployed and configured as described in Part 3 of this series. 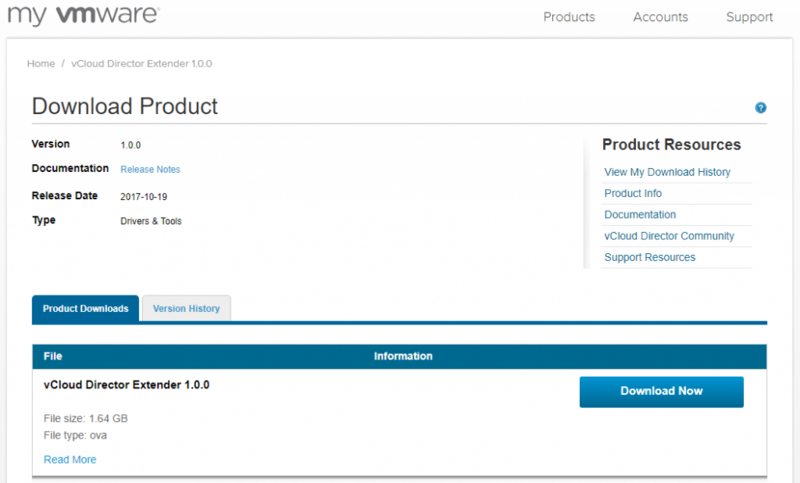 In either case you will still need to register the cloud provider in the CX interface. 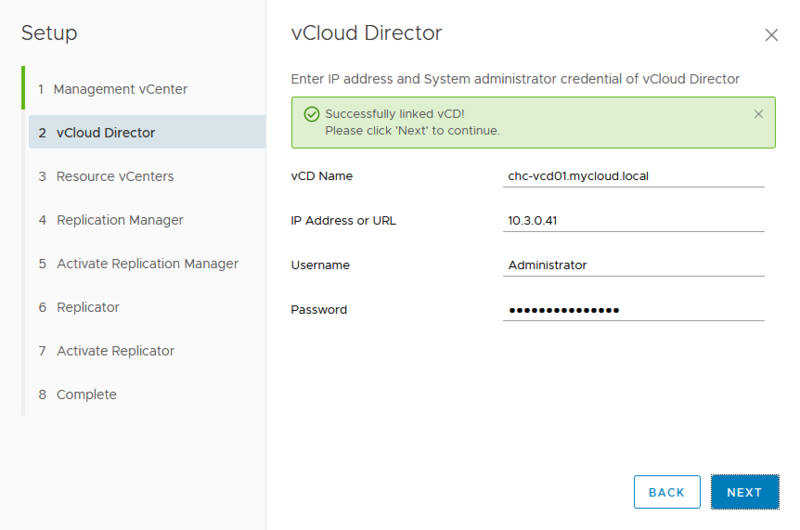 A configured vCloud Director VDC for the tenant to connect to. This environment must also have an Advanced Edge Gateway deployed with at least one uplink having a publicly accessible (internet) IP address. Note that you do not need to configure the L2VPN service on this gateway – the CX wizard completes this for you. At least one OrgVDC network created as a subinterface on this edge gateway. The steps to create a suitable new OrgVDC network are detailed below. 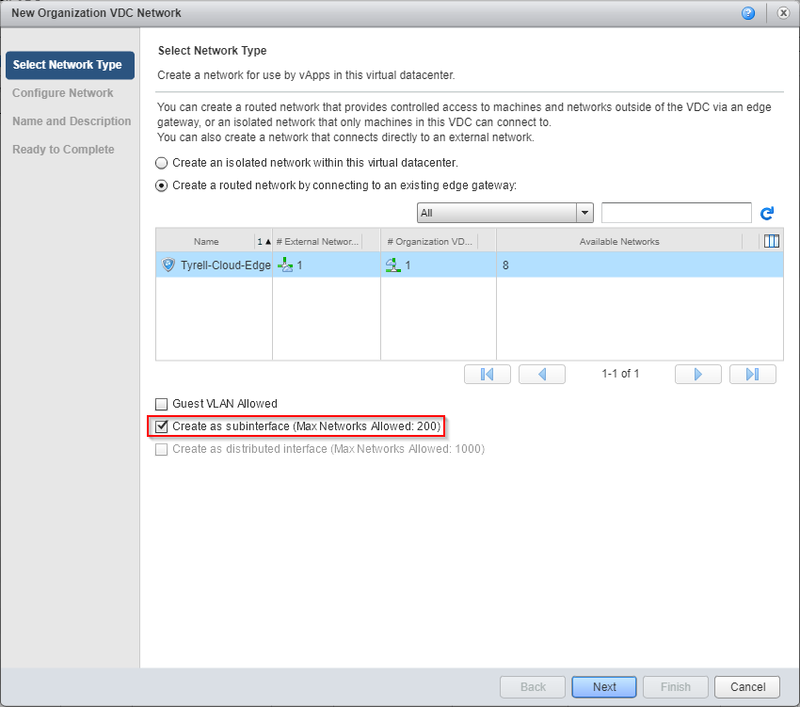 Outbound internet connectivity to allow the standalone edge deployed in the tenant vCenter to communicate with the cloud-hosted edge gateway – only port 443/tcp is required for this. 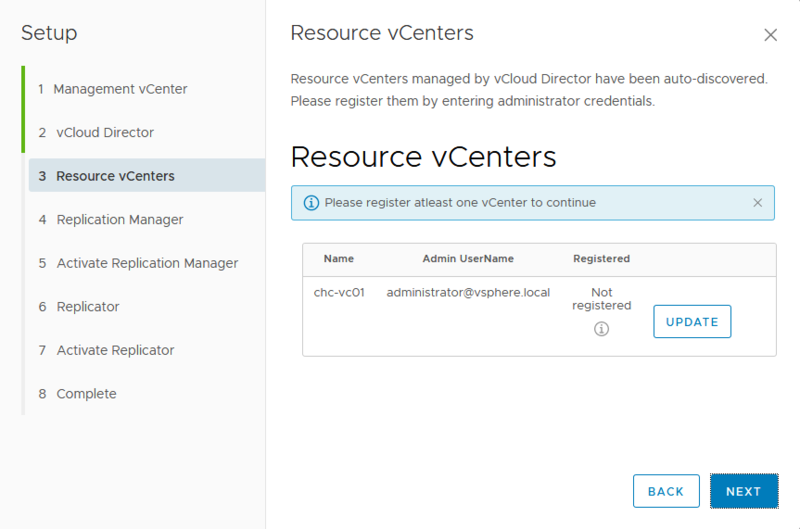 Administrative credentials to connect to both the tenant vCenter and the cloud tenancy/VDC (Organization Administrator role is required). The ‘Uplink Network Pool IP’ setting is a bit strange – it appears to be asking for a network pool or IP range, but the ‘help text’ in the field is asking for a single IP address. I found that the validation on this field is a bit odd – it will basically accept any input at all (even random strings) without complaining, but obviously deployment won’t work. What you need to do is add individual IPv4 addresses and click the ‘Add’ button for each. 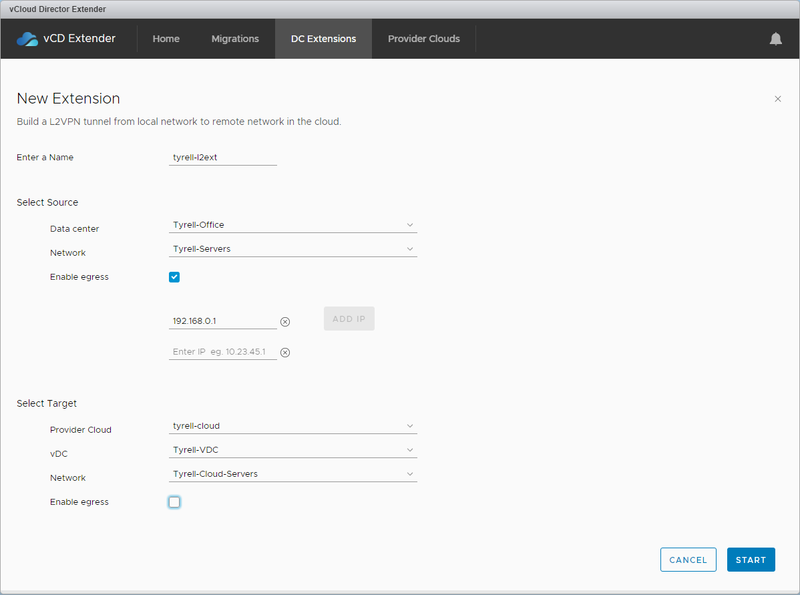 You will need 1 address for each stretched network you will be extending to your cloud platform. 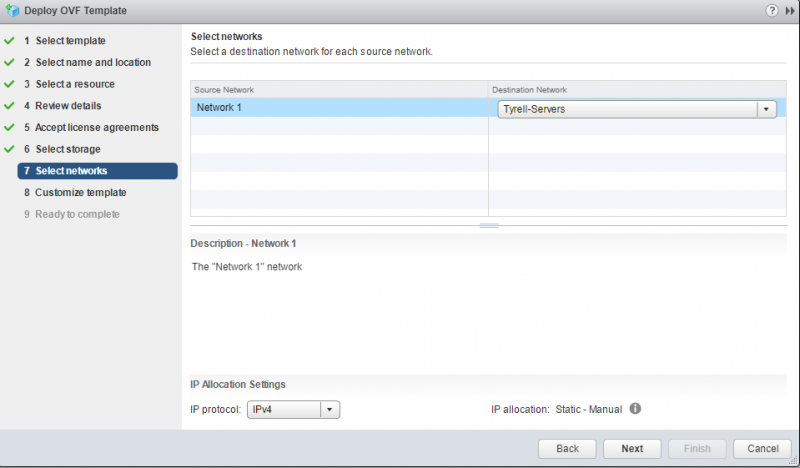 In this example I am only extending a single network so have added a single IPv4 address (192.168.0.201). 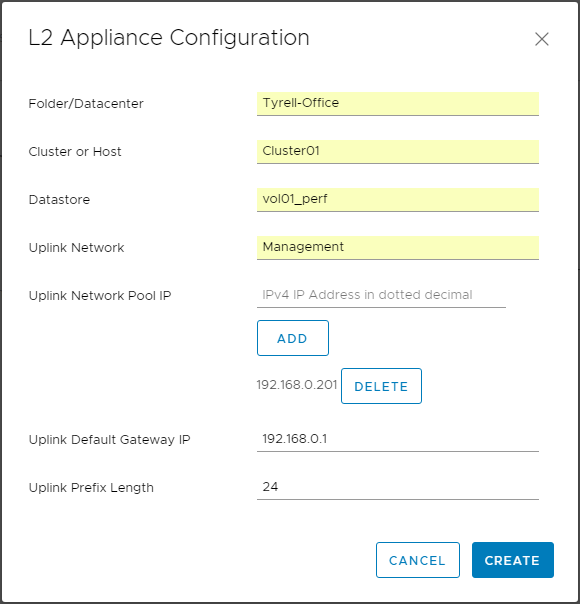 Note that there doesn’t appear to be any way to edit an existing L2 Appliance configuration, so if you need to change settings (e.g. to add additional uplink IP pool addresses) you will likely need to delete and recreate the entire entry. Reading from the bottom (oldest) upwards, a new port group is created, an NSX Edge Standalone appliance is deployed and powered-on and the new port group is reconfigured once this has completed (ignore the VM migration task, that just happened to occur during the same time window in my lab). In this case the new NSX standalone edge was named ‘mcloudext-edge-4’ and the port group ‘mcxt-tpg-l2vpn-vlan-Tyrell-VDC15’. 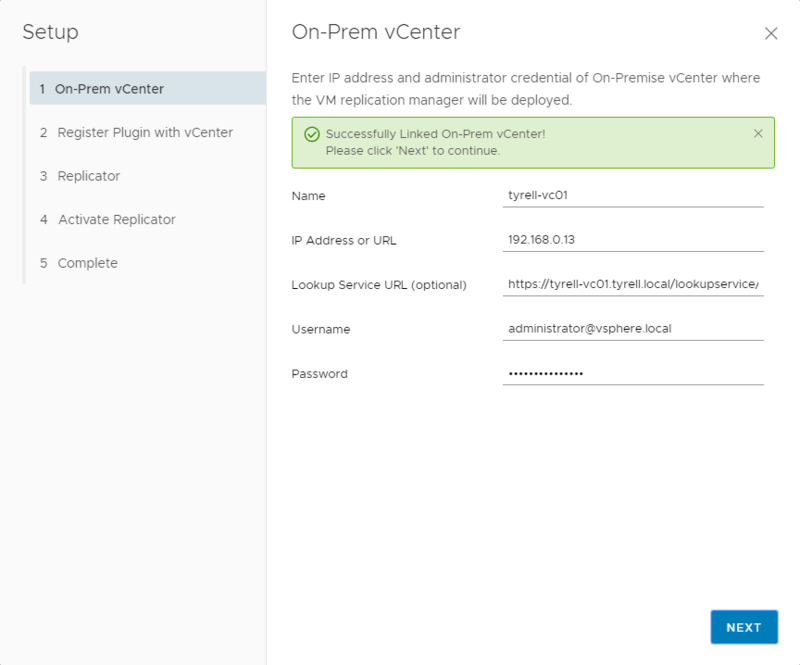 You will now find that any VMs connected to the stretched network (OrgVDC network) in your cloud environment have L2 connectivity with the on-premises network and will continue to function as if they were still located in the customer’s own datacenter. 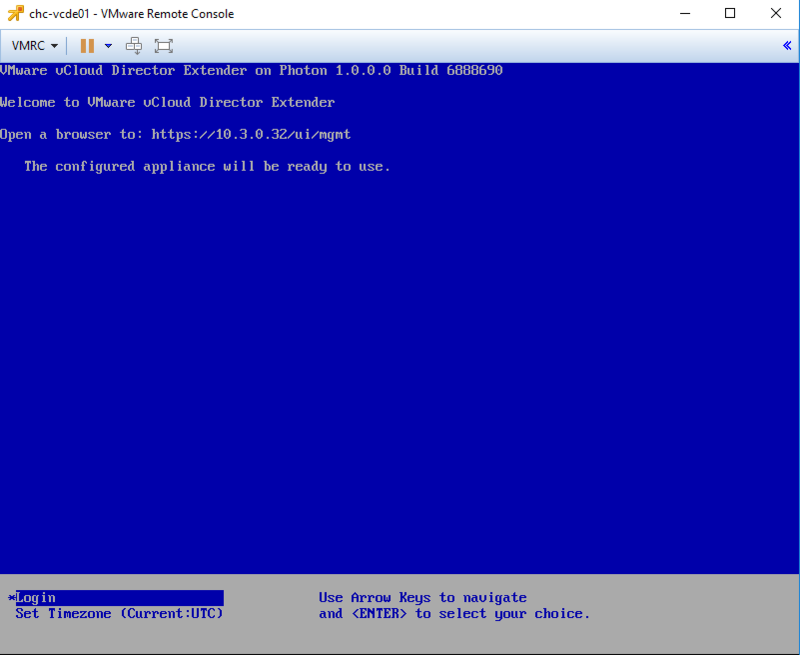 As I mentioned at the start of this post, I hit a number of issues when configuring this environment and getting it working took several attempts and a couple of rebuilds of my lab. 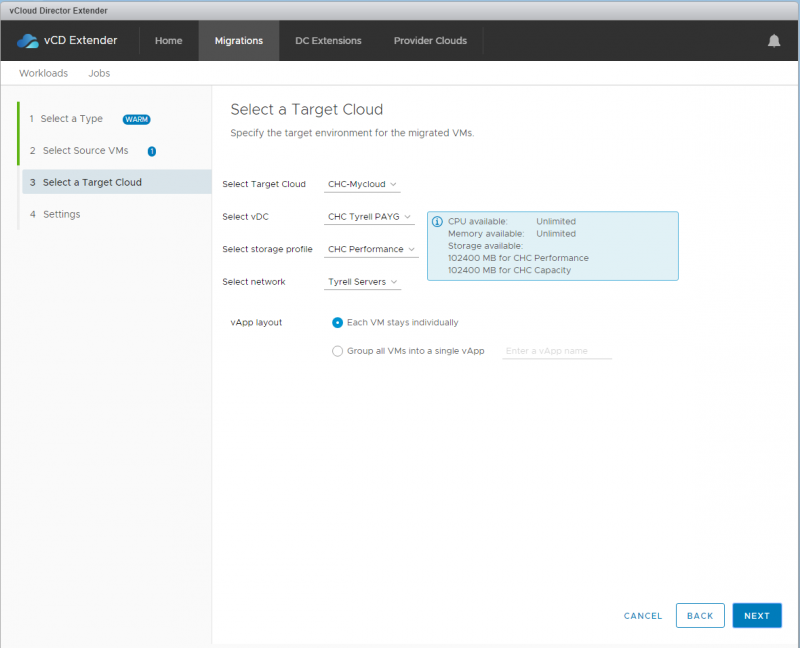 The main issue was that in the initial release of vCloud Director v9.0.0.0 there is an issue that prevents the details required for the standalone NSX edge being deployed from being returned by the API. 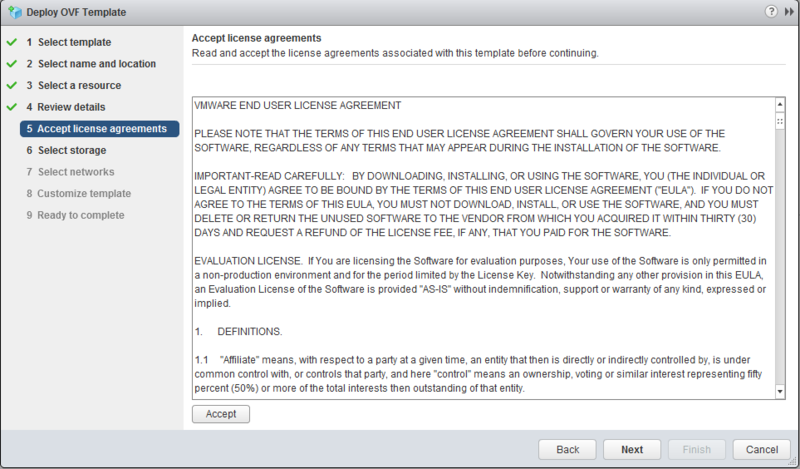 This prevents the deployment of the customer edge at all and resulted in my VMware support call. 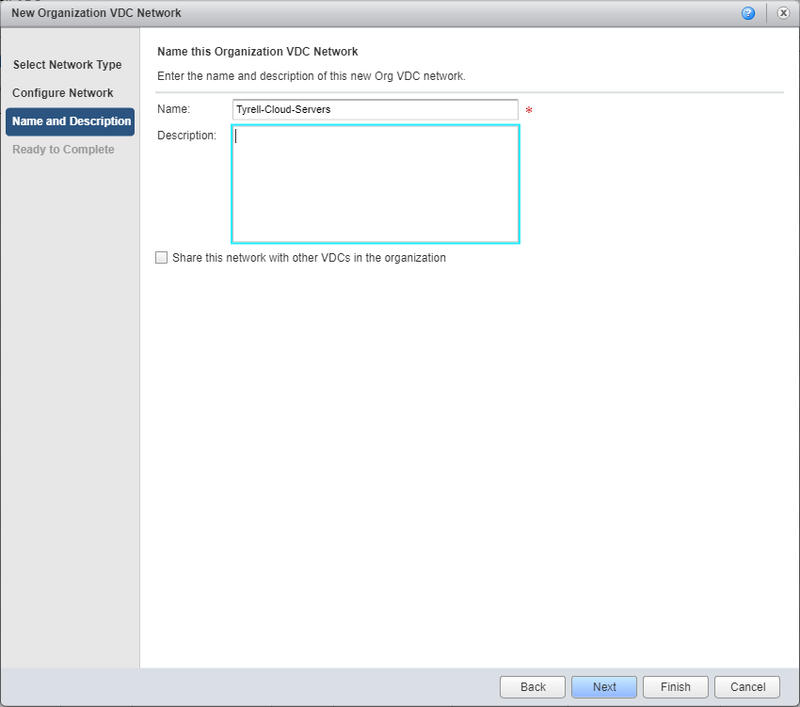 The specific issue is referenced in the vCloud Director 9.0.0.1 release notes as ‘Resolves an issue where the vCloud Director API does not return a tunnelID parameter in response to a GET /vdcnetworks request sent against a routed Organization VCD network that has a subinterface enabled.’ As far as I can work out, it will be impossible to successfully use L2VPN in CX without upgrading the provider to vCloud Director 9.0.0.1 to resolve this issue. The other issue I hit in my lab was that my hosted ‘Tenant Edge’ was NAT’d behind another NSX Edge gateway which was also performing NAT translation (Double-NAT). 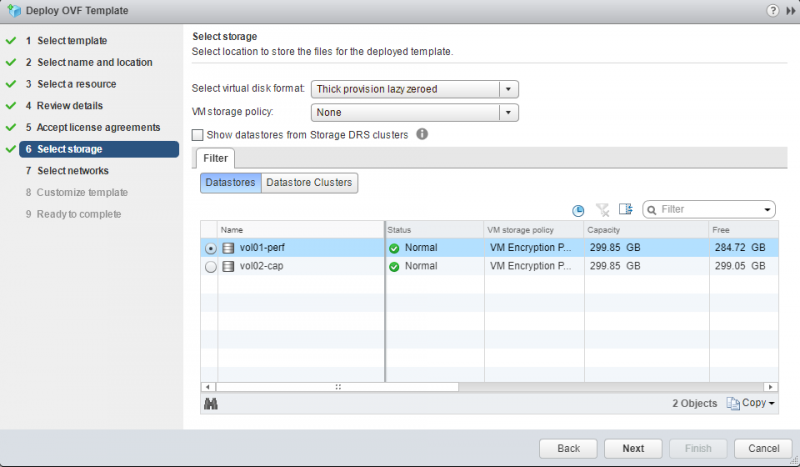 This was due to the way my lab is built in a nested environment inside vCloud Director. Unfortunately this meant the external interface of my hosted ‘Tenant Edge’ was actually an internal network address, so when the customer/on-premise edge tried to establish contact it was using an internal network address which obviously wasn’t going to work. I solved this by connecting a ‘real’ external internet network to my hosted Tenant Edge. As always, comments and feedback always appreciated. 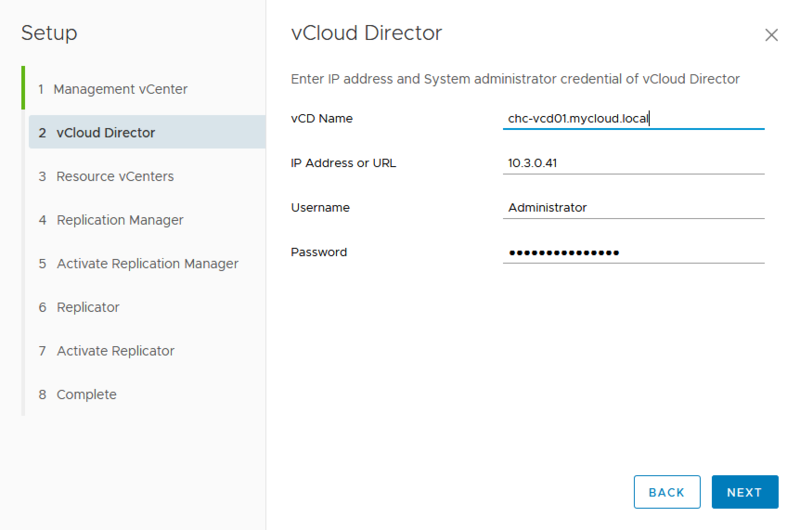 In the first 3 parts of this series I covered an overview of vCloud Director Extender (CX), the installation and configuration of CX at the Cloud Provider site and the installation and configuration of CX at the customer/tenant site. 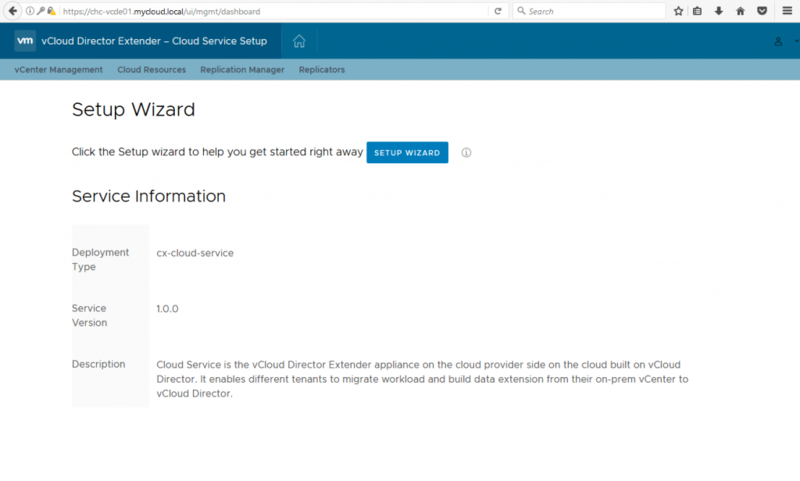 In this 4th part I will be covering the configuration of the tenant environment to connect to the provider cloud and then migrate VM workloads to the provider. 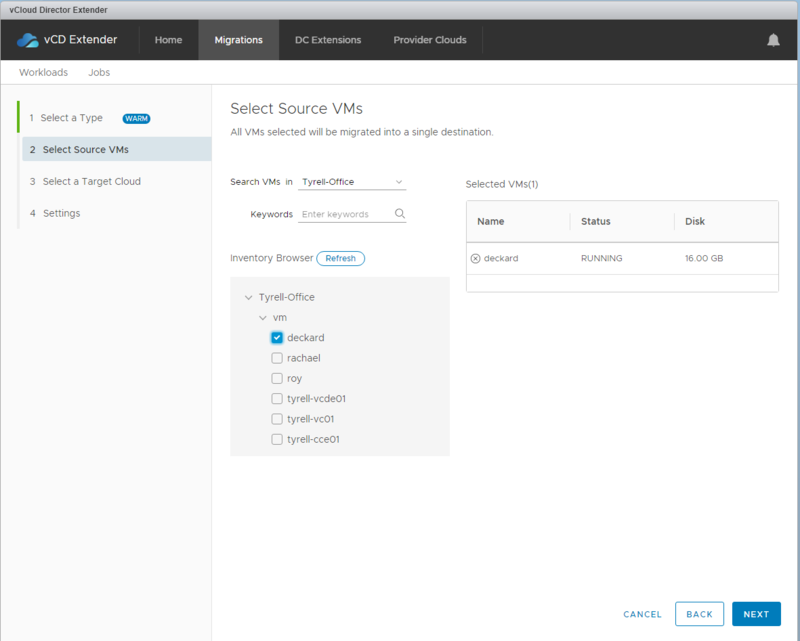 This part follows on from the configuration completed in part 3 of this series and assumes that Tyrell (the customer site) have an existing virtual datacenter (VDC) environment available from MyCloud (the provider) and an appropriate Organization Administrator login to this environment. 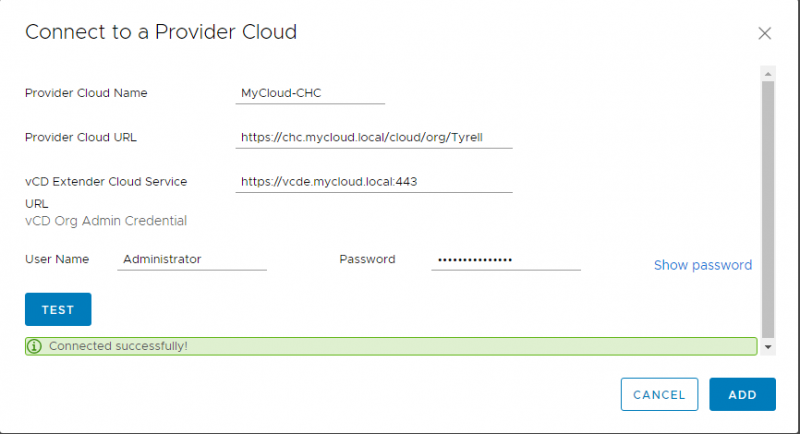 I’ve also created local DNS entries in the Tyrell network for the ‘chc.mycloud.local’ and ‘vcde.mycloud.local’ DNS names which resolve to the public IP addresses for the MyCloud vCloud Director instance and the provider CX endpoint respectively. Obviously in the real world these would be registered Internet DNS names. The ‘Provider Cloud URL’ needs to be set to include the appropriate path for the vCloud Director Organisation which is being connected to (the /cloud/org/Tyrell part in this example). The user details hold the Organization Administrator role within this cloud organisation. 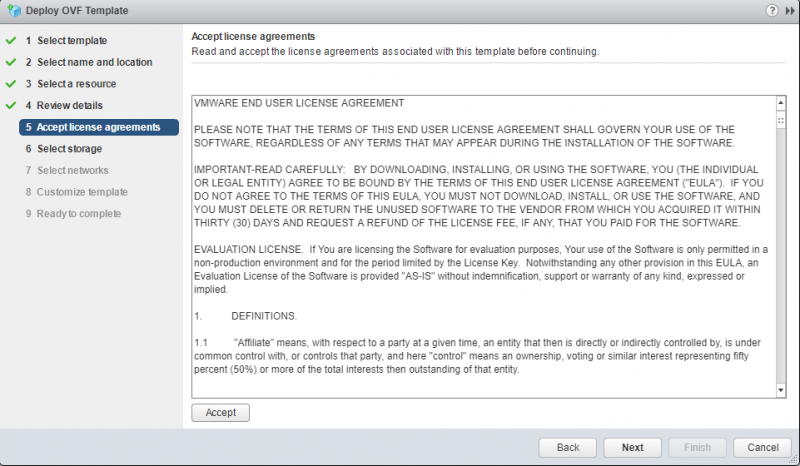 When clicking ‘Add’ you will be presented with a certificate warning if the cloud provider is not using trusted/signed certificates, you can optionally select to trust these certificates if this is the case (very handy for a lab environment). This is usually caused by incorrect firewall rules, NAT rules or Public Endpoint URL’s set incorrectly when the CX appliances are deployed, I’m intending to cover this in a future ‘Troubleshooting’ part to this series of posts. Once data synchronisation begins this status will be updated to show the synchronised percentage for the migration. If you get an ‘Error’ prior to the sync percentage moving from 0% this is almost certainly a network configuration issue (and one which I encountered frequently when first building my lab environment). 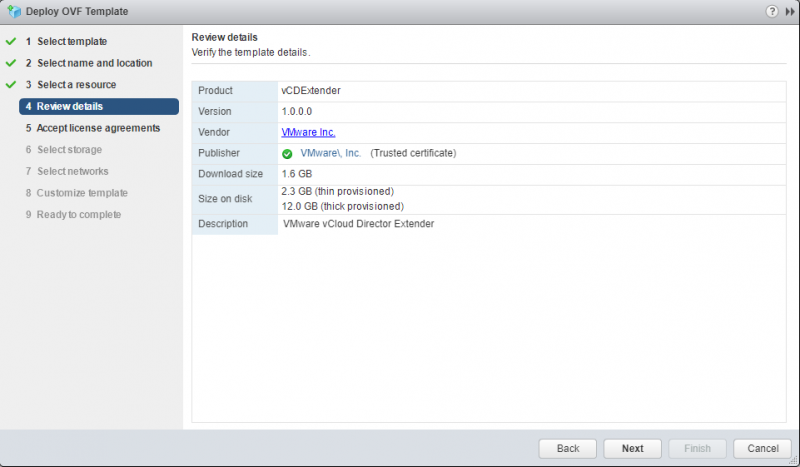 I’ll cover the common causes and remedies for this more in my vCloud Extender Troubleshooting post. 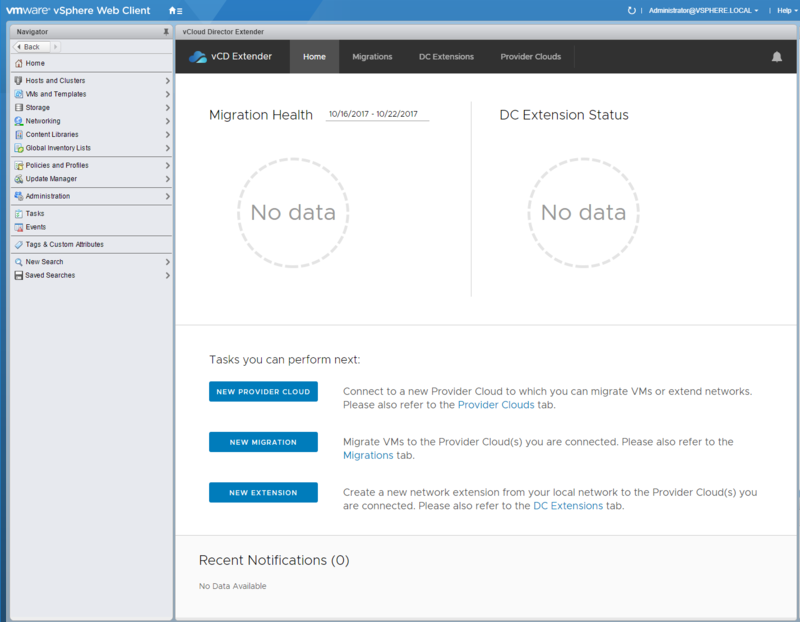 In the next part of this series of articles I look at the options to extend L2 networking directly from a customer site into vCloud Director using CX and the changes this introduces into the migration workflow. As always, corrections, comments and feedback are always appreciated. 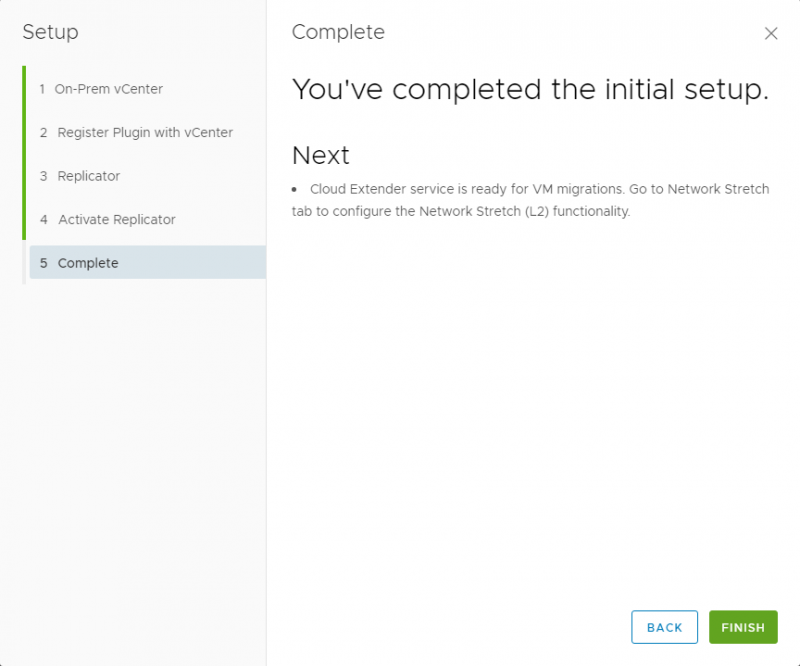 In part 1 and part 2 of this series I detailed an overview of VMware vCloud Director Extender (CX) and the configuration from a Service Provider perspective to configure their platform to support CX. 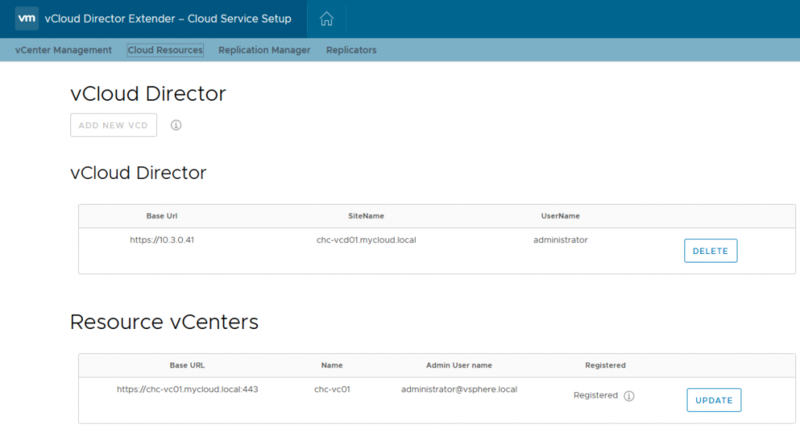 This third article in the series details the configuration steps required for a tenant/customer environment to deploy and configure CX into their environment. 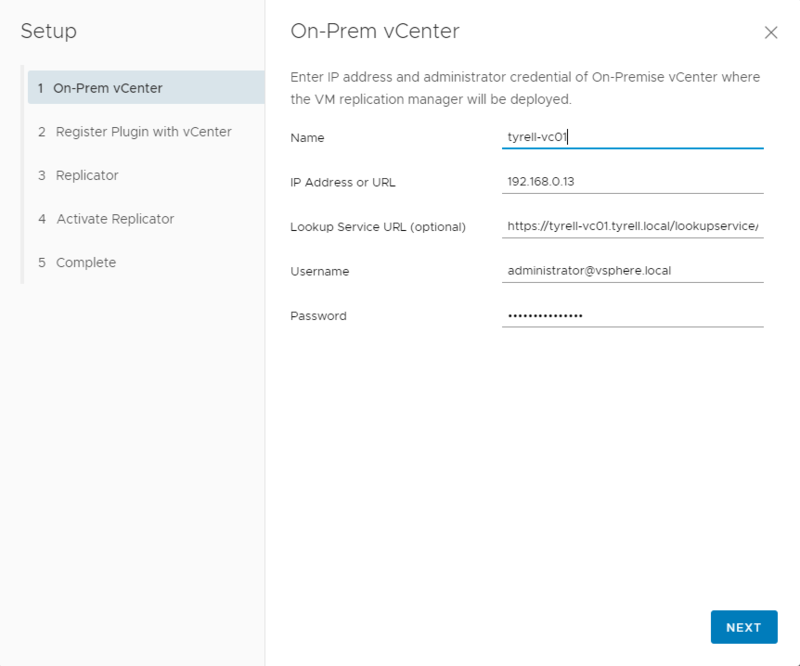 Once a service provider configuration is complete, any customers of that provider with sufficient allocated resources in a Virtual Datacenter (VDC) can configure the tenant CX environment and connect this to their vCenter environment. 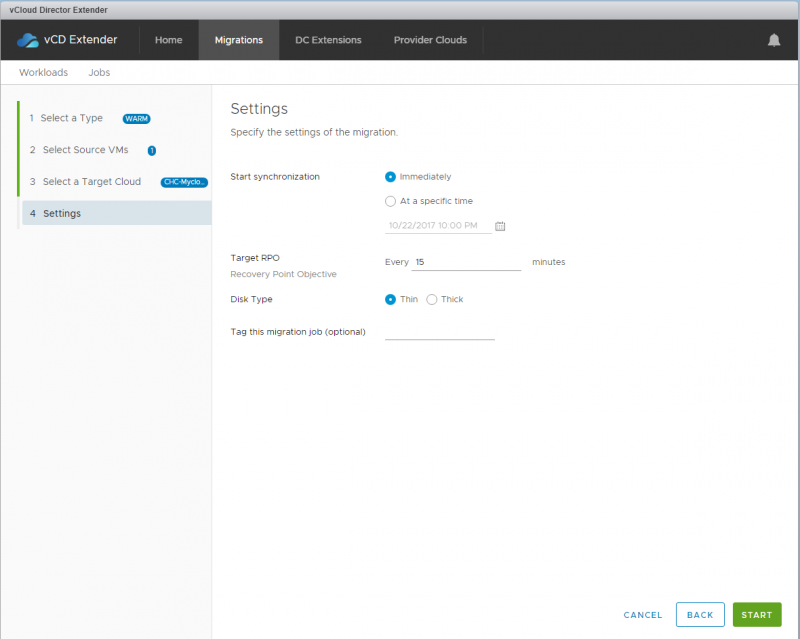 Once complete they will be able to migrate and replicate vSphere VMs between their own vCenter and the service provider datacenter extremely easily. Optionally they can use L2VPN functionality to stretch their networks into the Cloud Provider’s datacenter removing the requirement to have a pre-configured network in place. 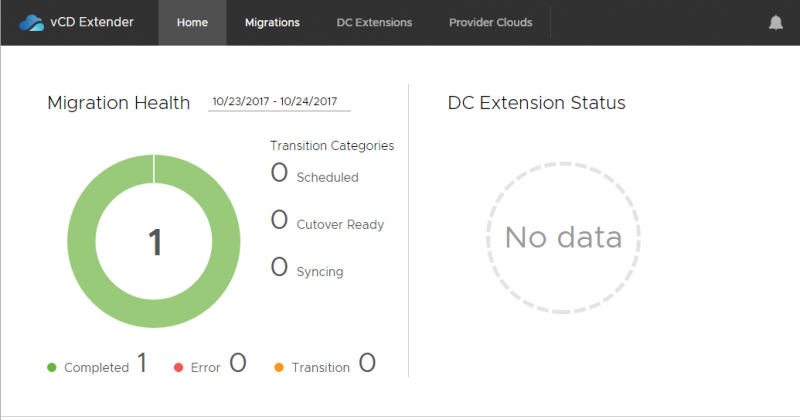 Of course many customers will wish to move to dedicated networking later, but having the initial ability to quickly provision their networks into a Cloud provider can dramatically shorten migration timeframes. The initial deployment steps for customers deploying CX are exactly the same as for a Service Provider – download (or have provided to them by their Cloud Provider) the ova appliance for vCloud Director Extender and deploy this into their vCenter environment. 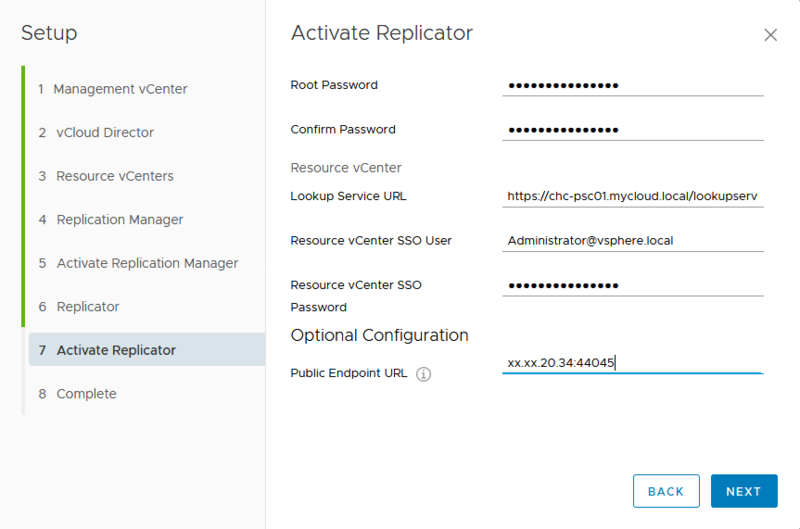 The next step is to activate the Replicator appliance by providing a root password and authentication details for the on-premise vCenter environment. 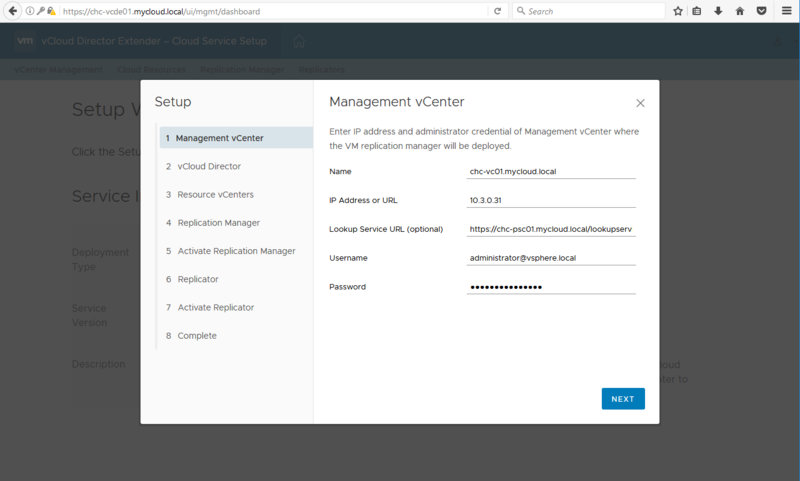 Note that you will need to set the Public Endpoint URL correctly in order for the appliance to be reachable by your cloud provider. 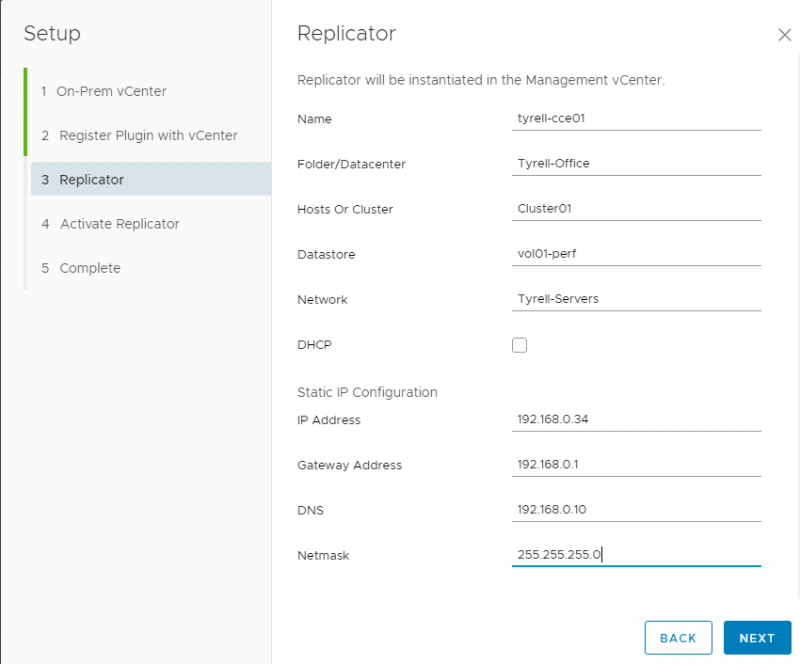 If the on-premise Replicator appliance is behind a corporate firewall (as most will be), you will need to configure inbound firewall and translation rules and make sure this field is set correctly. In my lab setup I configured the replicator public URL to be on port 443 on the public (Internet) address of the outside of the Tyrell firewall and used NAT port translation (see the networking configuration information below). 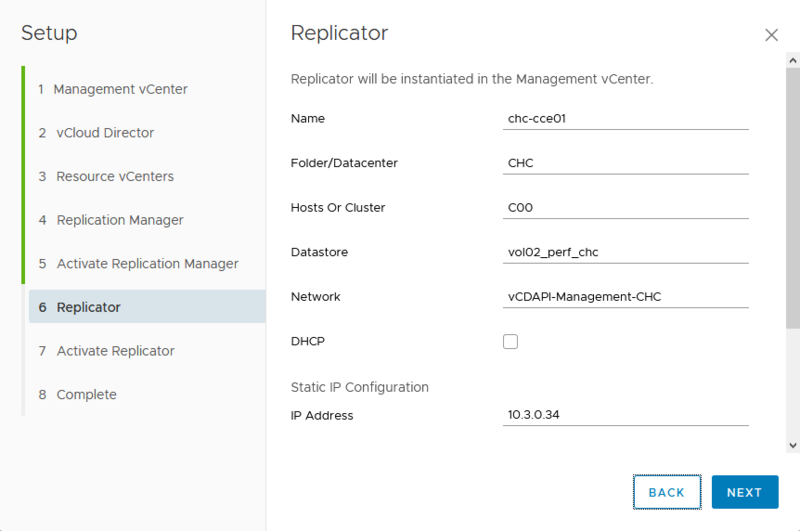 The networking configuration for a customer environment is a little simpler than for the cloud provider side, you will need to permit 2 inbound ports through the firewall, both of which need to communicate directly with the ‘Replicator’ appliance. 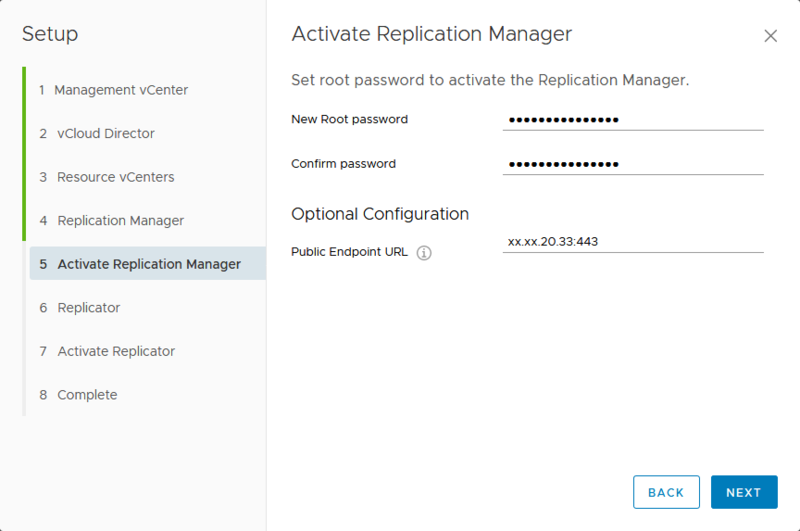 You can (and should) limit the public/external addresses permitted to communicate with your Replicator appliance to just those public IP addresses used by your Cloud Provider – they should be able to provide you with this information. Of course if your provider has configured different ports for these components you will need to allow access to these instead of the defaults listed. In the next part of this series I’ll continue with configuring the customer environment to connect to a cloud provider CX environment and to migrate some VMs. 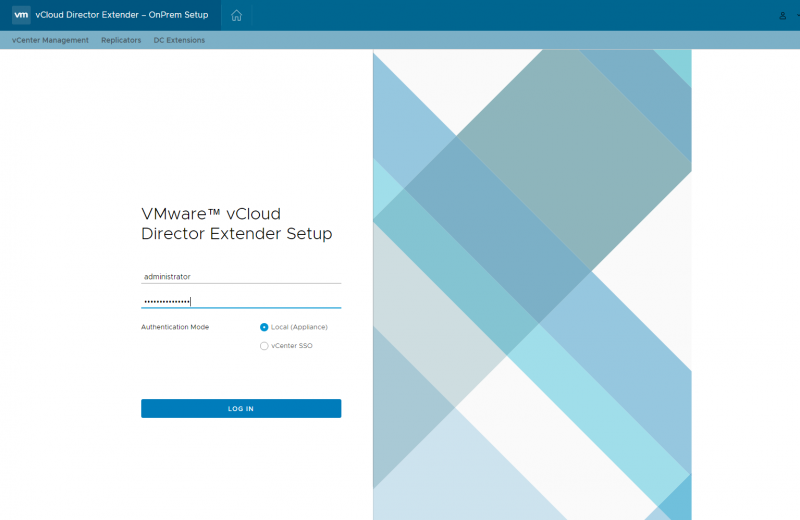 In the first part of this series of articles I described the new vCloud Director Extender (CX) software released by VMware. 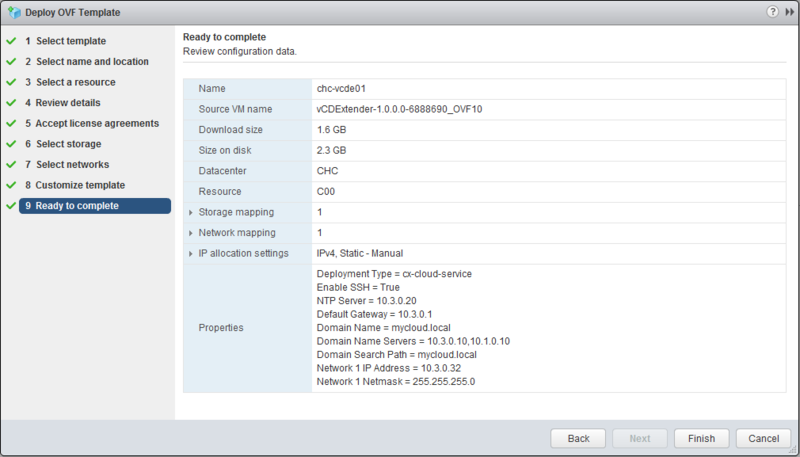 In this article I will show the steps required to install and configure the software from a Cloud Provider perspective. 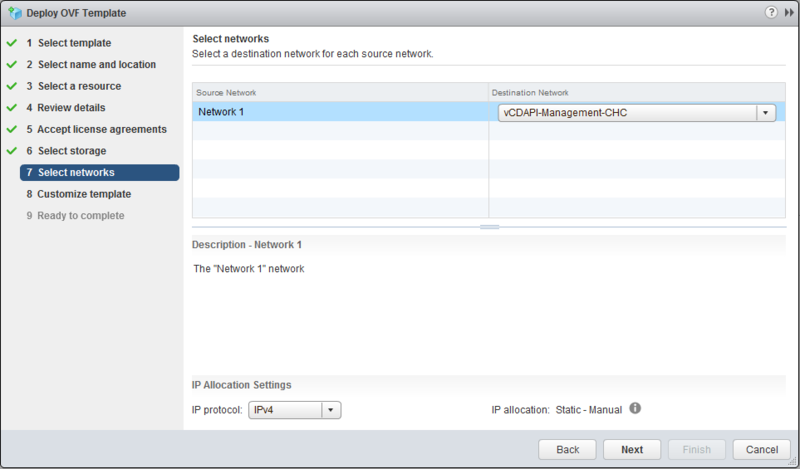 Included in this will be the necessary network and firewall configuration required. CX Cloud Service The main vCloud Director Extender appliance, this is used to provide the UI for setup/configuration. 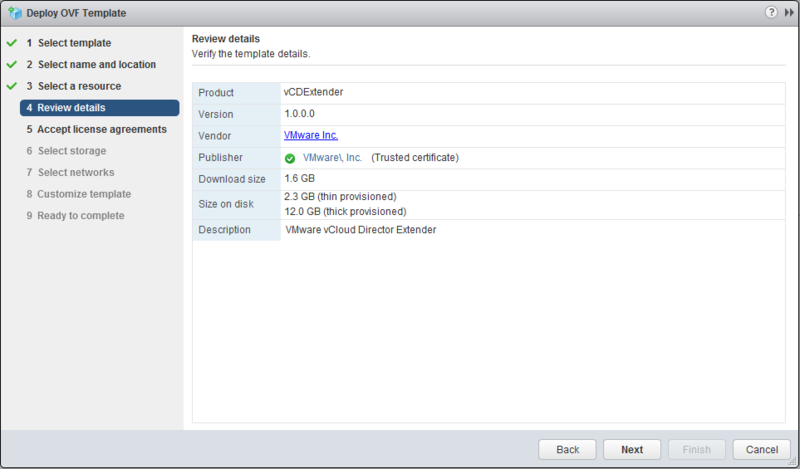 This is the appliance initially deployed from the vCloud Director Extender appliance download package. 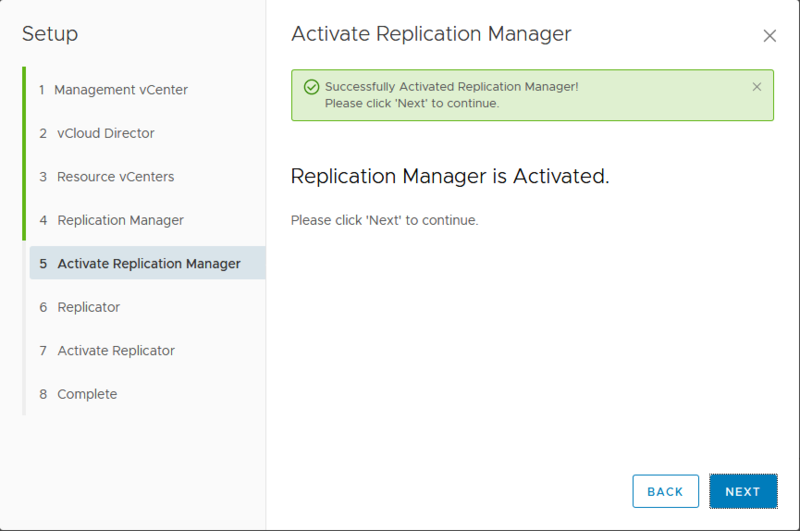 Cloud Continuity Manager (CCM) This component (also known as the ‘Replicator Manager’) is the operational manager of the deployment. 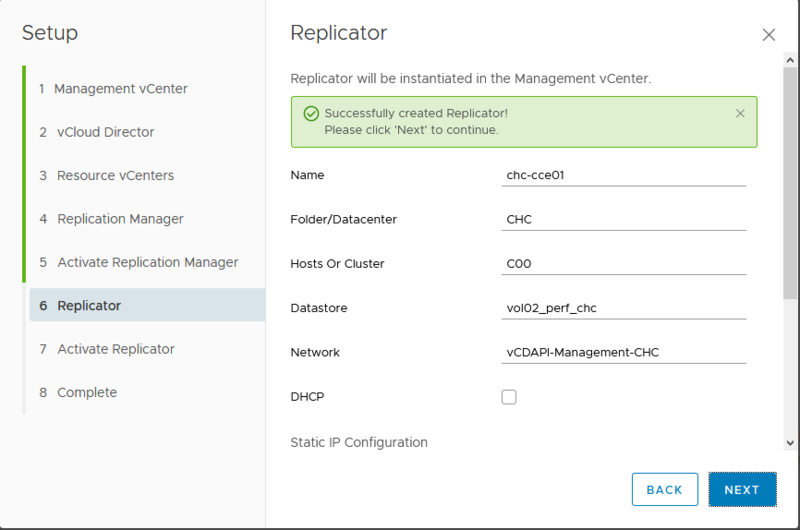 CCM only runs in provider deployments and manages the replicator (CCE) appliances. 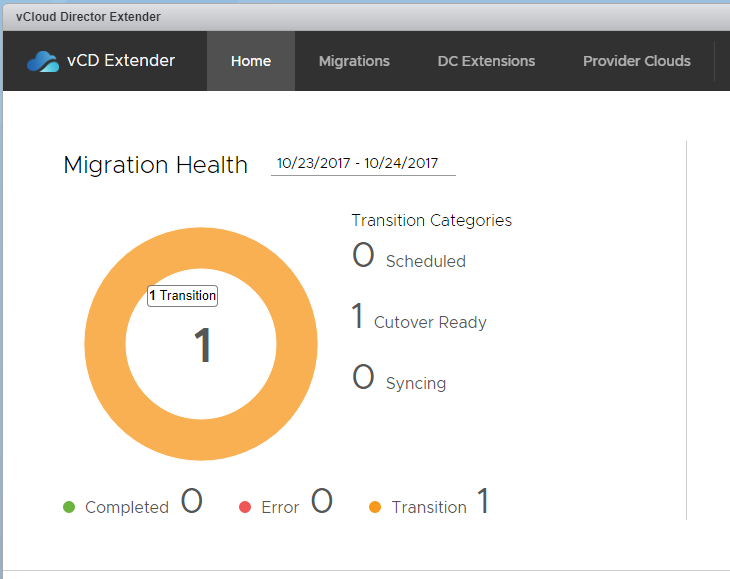 CCM appliances are deployed and managed by the CX appliance (no additional download is required). 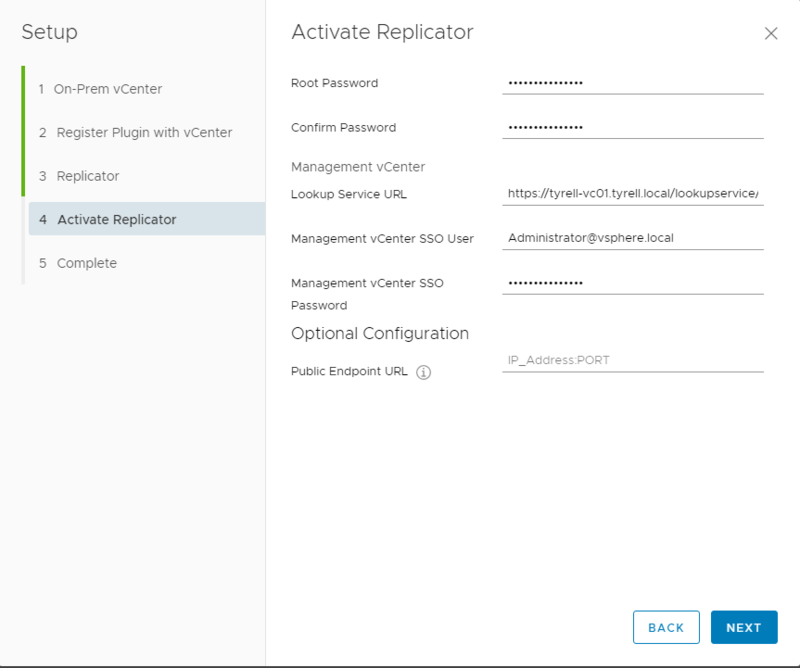 Cloud Continuity Engine (CCE) This component (also known as the ‘Replicator’) is the transfer engine that deals with data transfers between the customer and provider environments. 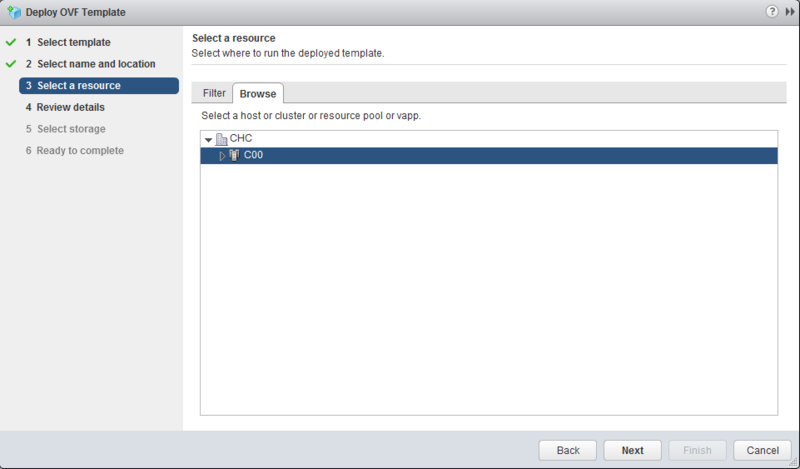 CCE runs in both the provider and client environments. 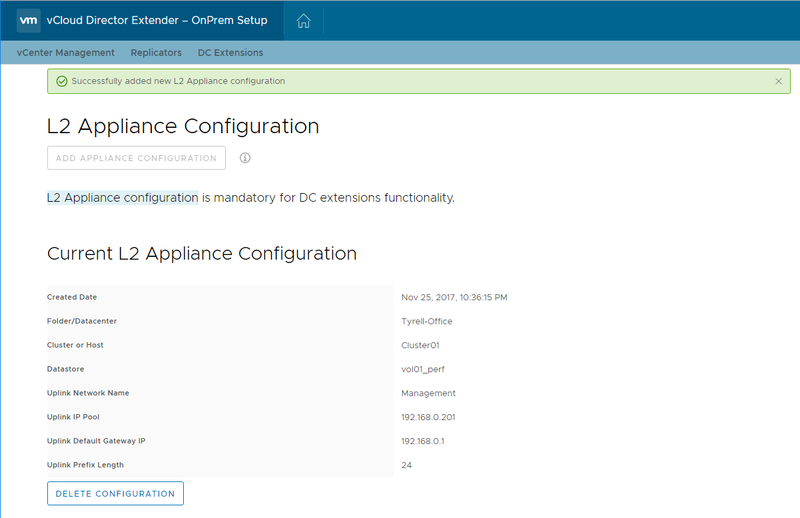 CCE appliances are deployed and managed by the CX appliance (no additional download is required). 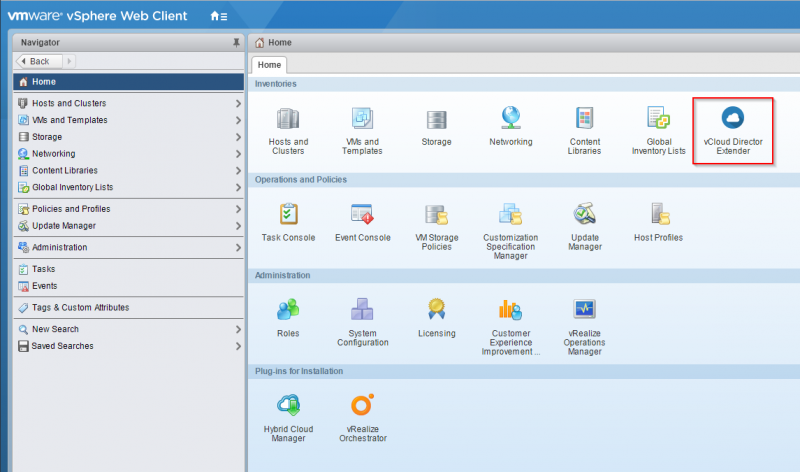 Next we can add the resource vCenters (where customer workloads actually run). 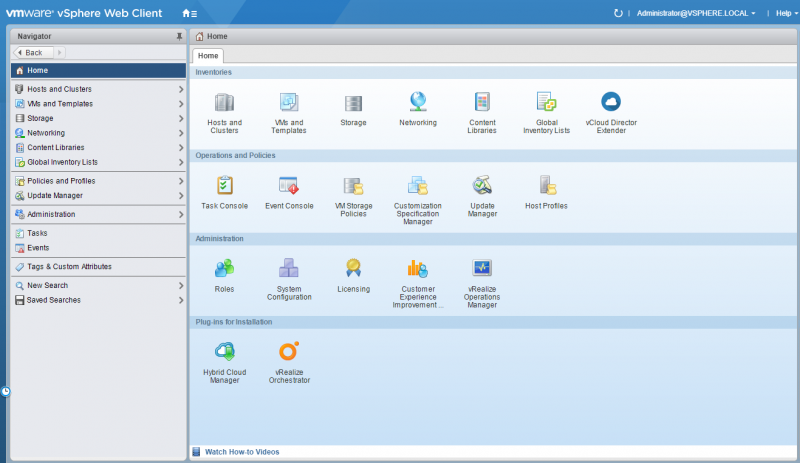 In my lab environment this is the same vCenter that supports the management environment so the details are the same, but in production environments this will almost certainly be different. 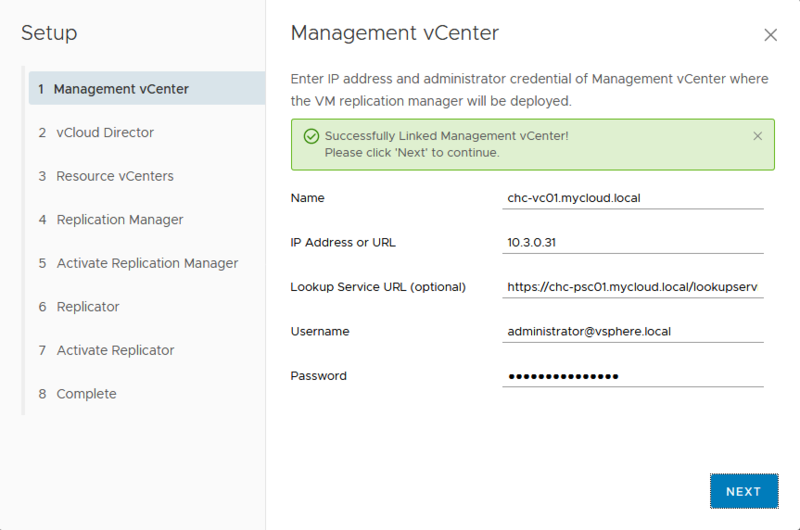 The setup wizard is intelligent enough to retrieve the names of any vCenter servers being used in Provider VDCs (pVDCs) in vCloud Director so for these you only need to ‘Update’. When you click update you’ll be asked to provide administrator credentials to the resource vCenter environment. 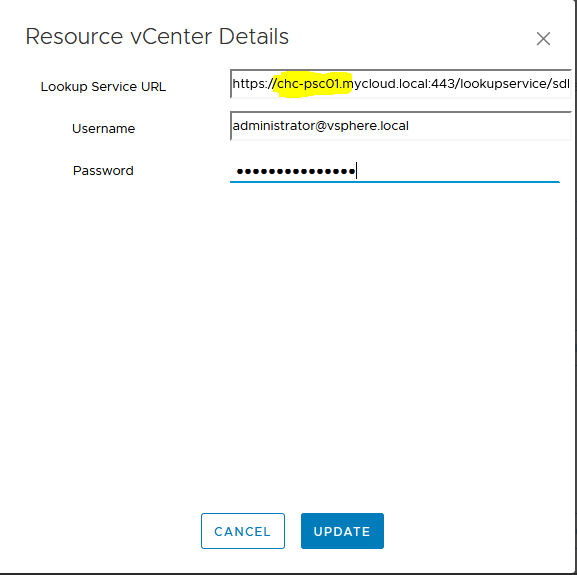 Be careful here as the default ‘Lookup Service URL’ will be set to the vCenter name, even if the vCenter is using an external Platform Services Controller (PSC) as mine was and will need to be manually edited to point to the PSC. 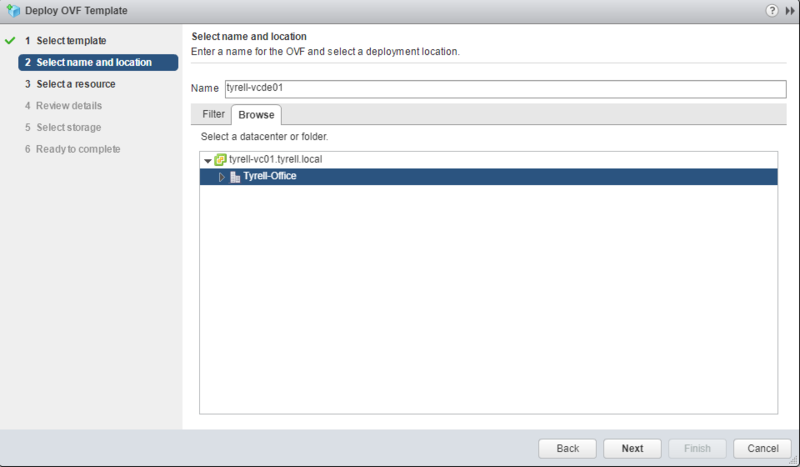 This caught me out initially and I couldn’t work out why authentication to the resource vCenter was failing. 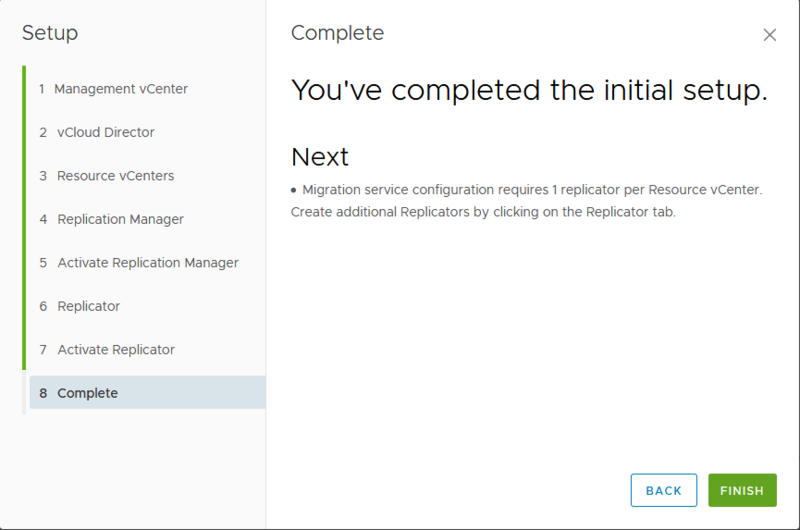 Next we need to configure the 2nd appliance configuration – this will be the ‘Replication Manager’ (also called the Cloud Continuity Manager / CCM in the documentation). We need to specify the parameters shown (the dialog scrolls down and also asks for default gateway address, DNS server address and netmask). 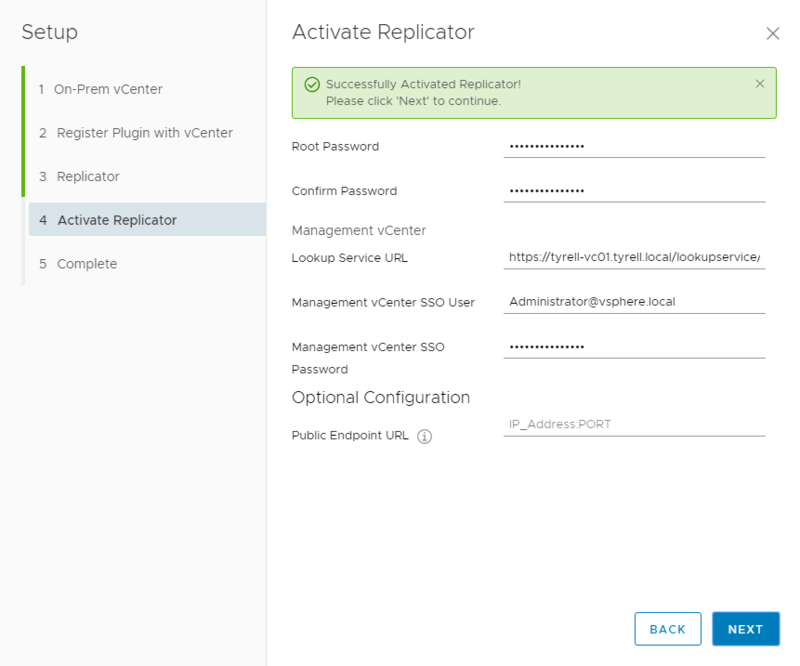 Next we have to ‘Activate’ the Replicator appliance by completing the settings shown below to authenticate to the resource vCenter which this Replicator will be responsible for. 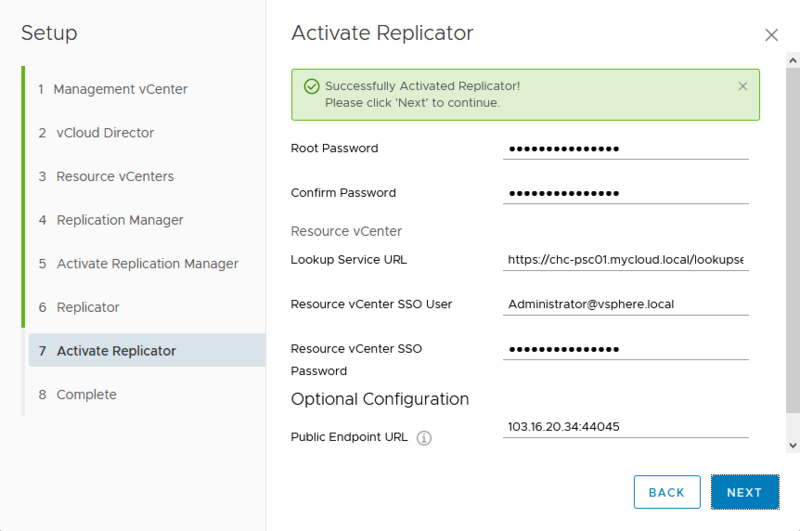 Th ‘Replicators’ tab shows the deployed Replicator appliance(s) – 1 per resource vCenter if you have multiples of these. 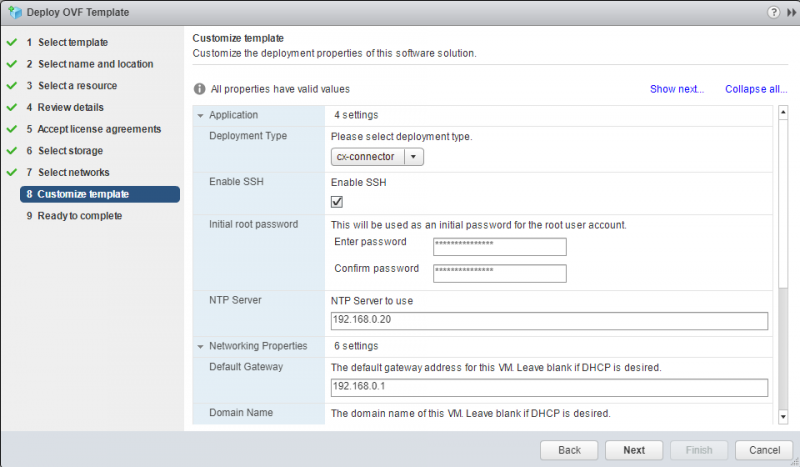 That completes the appliance installation and initial configuration, next you will need to configure appropriate NAT/firewall rules so that customers on the internet can connect to your new CX service! In the next part of this series of articles I’ll continue with the installation and configuration of the CX components required on the customer / tenant site. Last week VMware released version 1.0 of the new vCloud Director Extender (CX) (link to documentation set). This provides some extremely flexible options for customers to migrate servers to/from a vCloud service provider cloud platform, including the use of L2VPN to transparently stretch their on-premise networks to the cloud provider. 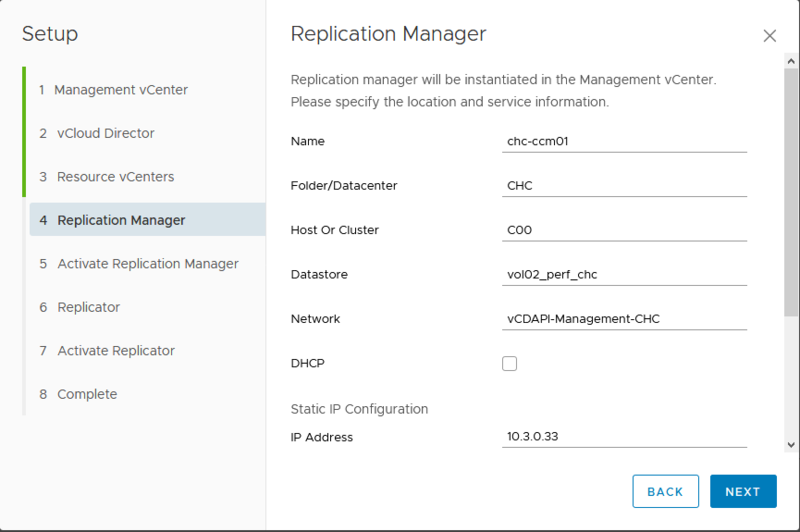 Together with a ‘warm’ cutover feature, this enables any customer with an appropriately configured vCloud tenancy and resources to safely and easily move their virtual servers to the most suitable hosting location with minimal application downtime. 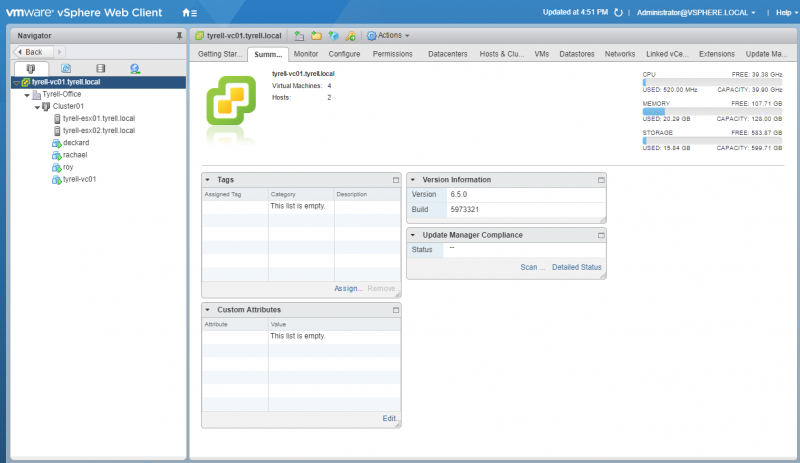 – The customer site must be running vSphere 6 Update 3 or later (6.5.0 and 6.5 Update 1 are also both supported). 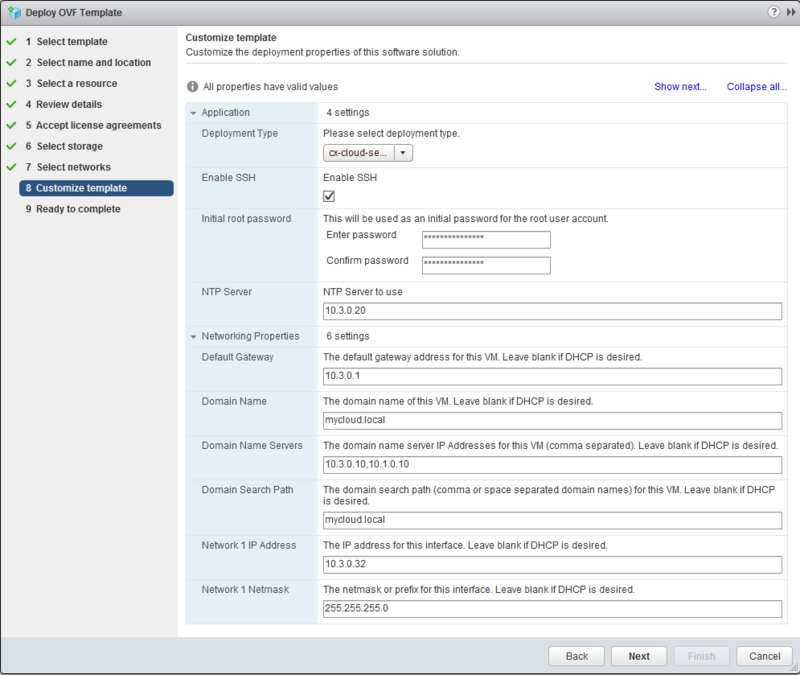 – If the customer wishes to use L2VPN network extension and is already running VMware NSX, this must be v6.2.8 or v6.3.2. 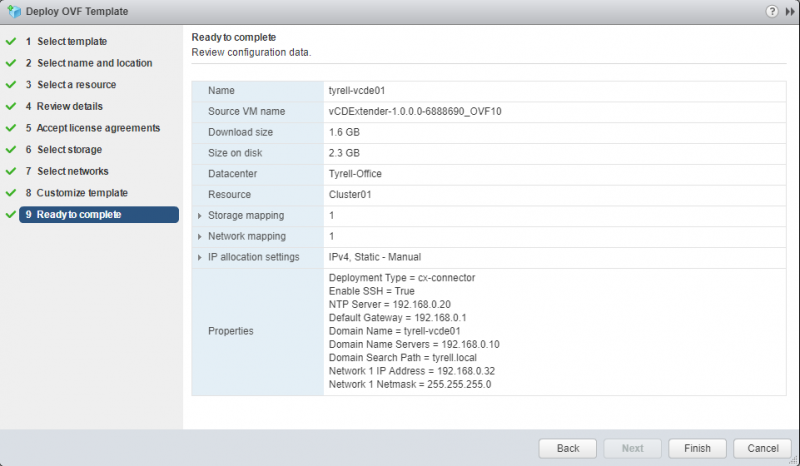 – The cloud provider must be running vCloud Director v8.20 or v9.0. 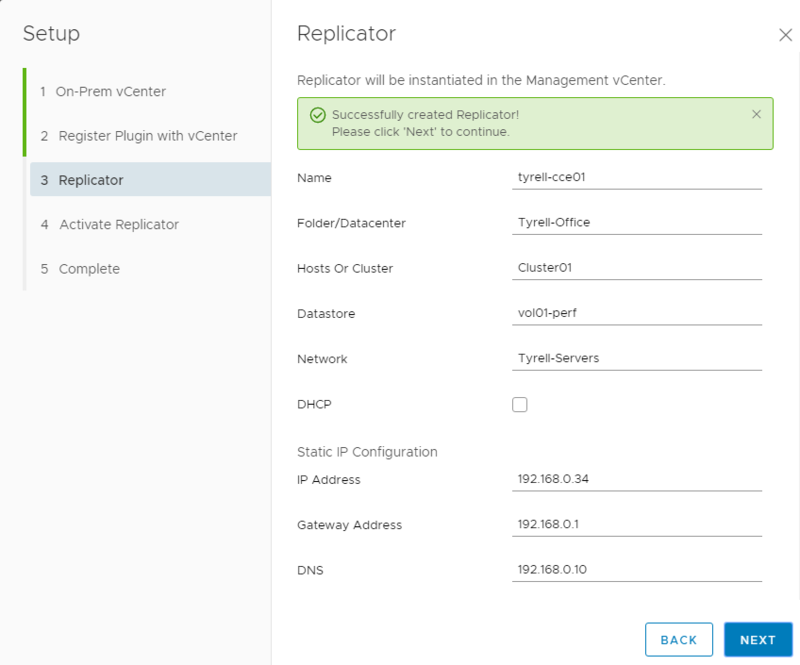 Deployment of the replication environment is different for the Cloud Provider and tenant (as you would expect) and firewall rules and address translation need to be appropriately configured to permit the required traffic flows at both the provider and customer end. 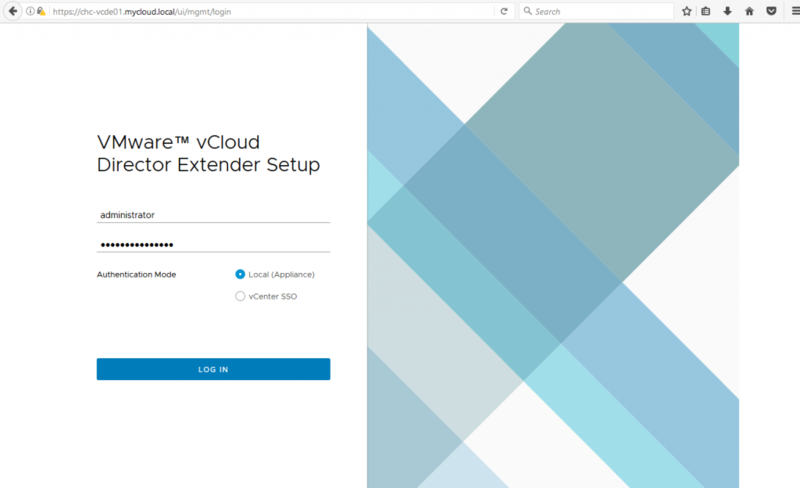 This series of articles will detail the installation and configuration of vCloud Director Extender and is intended to be useful for both Cloud Providers needing to configure their own environments to support CX and for customers wishing to configure their environments to allow migration to/from a CX-enabled provider. 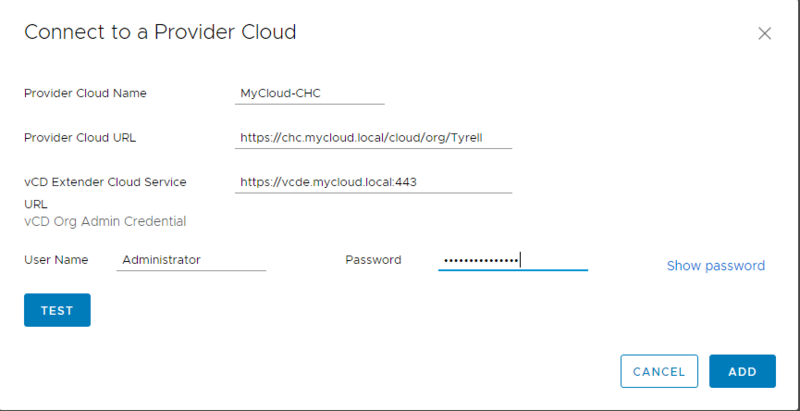 The environment that I will be describing and building through this series is shown in the graphic below, Tyrell Corporation is the client organisation and MyCloud is the Cloud Provider which Tyrell wish to use to host 3 of their production VMs (‘Deckard’, ‘Rachael’ and ‘Roy’). In this example Tyrell and MyCloud happen to use different internal IP network ranges, but that is not a requirement to use CX since NAT firewalls are in place at both organisations. 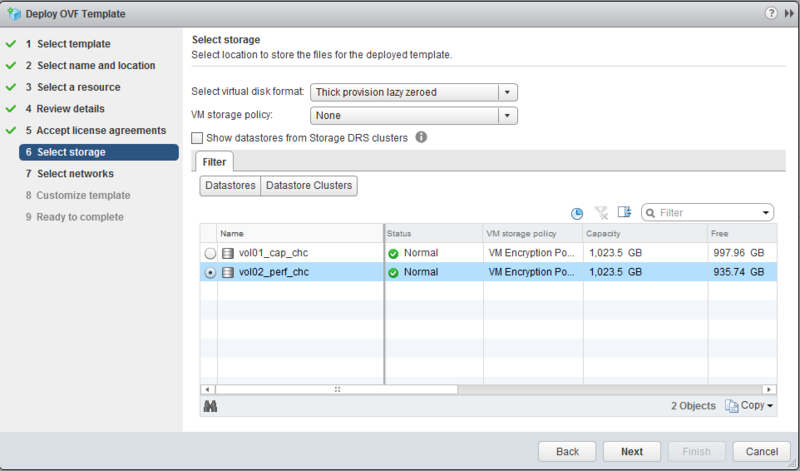 Since I built this environment using ‘real’ public Internet addresses and VMware NSX edge gateways as the firewalls for both Tyrell and MyCloud, I have stripped the public IP addresses from the configurations shown in these articles, but it should be easy to see where these are substituted. I’m still working on the later parts of this series so check back if I haven’t published all of them yet.